Atos’ supercomputer, the BullSequana X1000, was officially inaugurated on September 18 at the Jülich Supercomputing Centre (JSC). 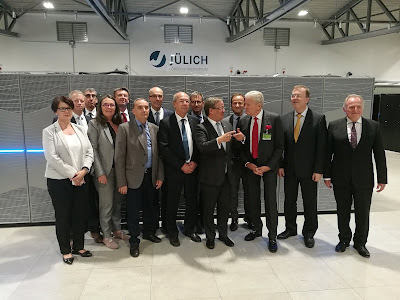 The centre’s new flagship computer and currently Germany’s fastest supercomputer, named JUWELS (short for Jülich Wizard for European Leadership Science) was inaugurated in an official ceremony at the Jülich Supercomputing Centre (JSC) by Federal Research Minister Anja Karliczek and Armin Laschet, Minister President of the State of North Rhine-Westphalia, with representatives from Julich and Atos. “Atos is proud to provide researchers at the Jülich Supercomputing Centre with the computing power they need to accelerate their research and maintain their level of innovation. The decision to choose our BullSequana X is testament to our technological excellence in high-performance computing.” says Agnes Boudot, Group VP, Head of HPC at Atos.